You are here: Home / intuition / Intuitive Counseling: You are your own Best Counselor! Last fall, in a telephone conversation with my mother, I apologized for not having called but I’d had a few “downer” days and just couldn’t summon the energy to talk to her. At 92 years old, her response was: “Whenever I have a bad day I give myself a good talking to and snap out of it!” Wow! Thanks, Mom! She maintained that kind of energy to the day she passed away five months later in Halifax, Nova Scotia. For many years, she was, in a way, an intuitive counselor as she ran a boarding house and sometimes I could hear quiet conversations with a boarder late at night in the kitchen. As a young child, I knew even then the conversations were confidential, even though (I confess) I tried hard to hear and stay awake to listen! Her feedback was sometimes religious-based and home-spun, but mostly she just seemed to listen. Being able to provide intuitive counseling’s to ourselves in a quiet moment or to others is a gift. The highest quality spiritual mentors are able to tap into their wisdom, clear sensitivity and yes, their angels, guides or whatever you choose to call this connection. They also abide by high, consistent standards. They know when to help others and when to let them be and work out their own challenges, even if that means resisting the desire to help them. In providing counseling and coaching to others, these gifted Yeoman of Spirit ensure they never become anyone’s guru and leave people dependent on them for advice and help. These mentors are true wayshowers who live by example, clear motives and provide feedback to others without getting themselves in the way. They share freely without the shellac of their own conditioning, which can come from their upbringing, societal standards or even other lifetimes. Clear motives are important, whether we are intuitive counselors to others or to ourselves. When motives are to be of service, we can be an even more impactful force. How can we apply intuitive counseling to ourselves? (Admittedly, sometimes we can use an outside perspective.) Well, let’s take a look…. It’s worth it to invest time into increasing our intuitive awareness and angel communication. We become better at avoiding or learning to deal with difficult people or situations. In following our hunches, we’ll tend to land in more positive and inspiring situations, including our niche. In a sometimes hectic world it can be challenging to listen to our gut as we pick up so many outside thoughts and feelings throughout the day. But as we learn to relax and tune into our inner senses, we can know the clear, helpful inner messages from outer noise and confusion. Minding our own business keeps us focused so we can more easily draw from our own discernment and inner clarity to evaluate what we pick up. Listening to our sensitivity happens more easily when we are relaxed. Being able to work with our angels bolsters intuitive or psychic awareness. In working with Inner Guidance, an individual can clarify, verify and re-check what he or she “picks up”. Speaking for myself, my Guidance often enriches the information I receive with additional wisdom and insights. They can provide reassurance. As an aside, this private consultation shown at the right can help you learn to have a clear, two-way communication with your angels. What can undermine being our own best mentor is excessive thinking and brooding. The conscious thinking mind helps interpret and accomplish. It’s my Real Soul Being that needs to be in charge, though. Trusting ourselves is key. Another key is to avoid coloring experiences with “likes and dislikes” or seeking only our comfort zones. We are here to learn and grow, and sometimes that is not going to happen as much in a comfort zone. Like Estelle’s mom, how have you been your best intuitive counselor, knowing that the answers are within you? 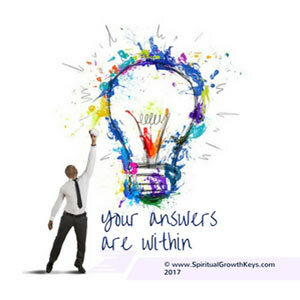 Share any insights you receive when you ask yourself that question! In addition, if you feel that being an intuitive counselor is your calling we can help. Planet Earth needs more sincere people who know that they know. With spiritual maturity and the experience and understanding of what society, science and religion are all about, the sky is the limit. There’s no doubt that more strong, concerned people are needed to be wayshowers and intuitive counselors on this earth at this time. Angels are a way of life for Estelle Small, who has many years' experience leading lectures, workshops and private consultations on angel communication and living one's true purpose. She started as a journalist and then a government senior policy advisor in Ontario, Canada. In each career her life path included many angel and intuitive experiences, dating back to childhood. She has found connecting with angels very practical in her own life and shares a step by approach for anyone who wants to have a direct two-way communication with their angels also.